With over 30 years of experience in printing carrier bags, you can be assured that you are dealing with an organisation you can rely on. There is only one reason why we have managed to operate for this long and that's customer satisfaction! The carrier bag industry has changed over the decades and we have evolved with the industry from one era to another but keep certain principles the old fashioned way, which most of our clients appreciate still today. 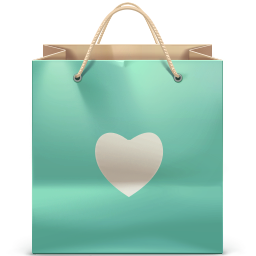 Unlike many other carrier bag printers, PSK still print in the traditional way and therefore can offer you a very fast turnaround time. 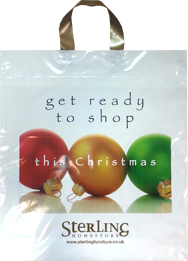 You can have your carrier bags printed with your design and delivered within a week depending on the order. 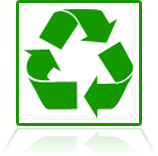 PSK promote the Environment Protection Strategy and therefore supply both fully recyclable and biodegradable printed carrier bags that all bear the relevant ECO logos and symbols such as the International Recyclable Logo. Packaging Supplies Kidderminster and Packaging Products Group UK have merged together as of 5th October. The merger strengthens our combined position resulting in greater efficiencies enabling us to stay competitive. Please continue to contact us via the usual channels, the new accounts address is on the contact page. 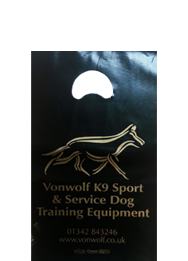 Our premium bags are available from one printed colour through to a full colour process with a range of different biodegradable bag colours and handles. 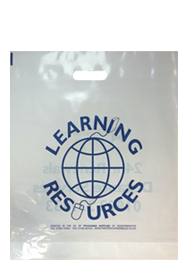 These fast turnaround over-printed carrier bags are producedWITHIN 3 DAYSin one colour on to your choice of selected white, clear or coloured recyclable withNO MINIMUM QTY GUARANTEE! 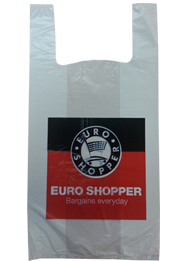 The High Density Polyethylene supermarket vest type bags are now available in a environmentally friendly degradeable version. Available in various sizes of all grade thicknesses suitable for your purpose of use.